Chökyi Nyima Rinpoche (Tib. ཆོས་ཀྱི་ཉི་མ་རིན་པོ་ཆེ་, Wyl. chos kyi nyi ma rin po che) (b.1951) — as the oldest son of Kyabjé Tulku Urgyen Rinpoche, Chökyi Nyima Rinpoche was recognized at 18 months of age as the seventh incarnation of Gar Drubchen, a Drikung Kagyü master and an emanation of Nagarjuna. Soon after, he was enthroned at his predecessor’s monastery, Drong Gon Tubten Dargye Ling Monastery, in Nakchukha, Central Tibet. At the age of 13, he entered Rumtek Monastery and spent the next eleven years studying the Karma Kagyü, Drikung Kagyü and Nyingma traditions under the guidance of the 16th Gyalwang Karmapa, Kyabjé Dilgo Khyentse Rinpoche, Kyabjé Tulku Urgyen Rinpoche and other eminent masters. Before leaving Rumtek, Rinpoche successfully completed the coursework set out for tulkus. In 1974, Tulku Chökyi Nyima was instructed by the Karmapa to help his father to establish a monastery in the Kathmandu Valley. He also advised Rinpoche to turn his efforts towards instructing western practitioners. 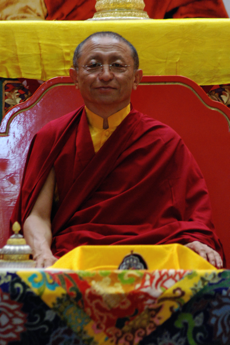 Rinpoche has a good command of the English language, and has been instructing a growing number of western students in meditation practice since 1977. This page was last edited on 14 May 2018, at 04:02.